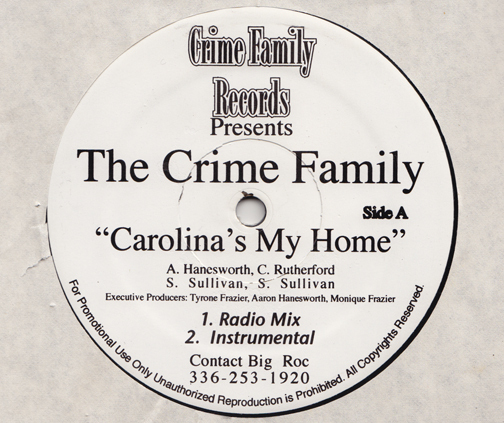 As with most Tarheel records from the 1980s, this is largely unlistenable. The term “novelty” only begins to contextualize the piano boogers, cowbell abuse, Huey Lewis sax-foolery, and wet-noodle vocal posturing that mar this attractive picture disc. What is actually pretty cool is the Switched-On rendition of “Stars and Stripes Forever.” That I can live with. 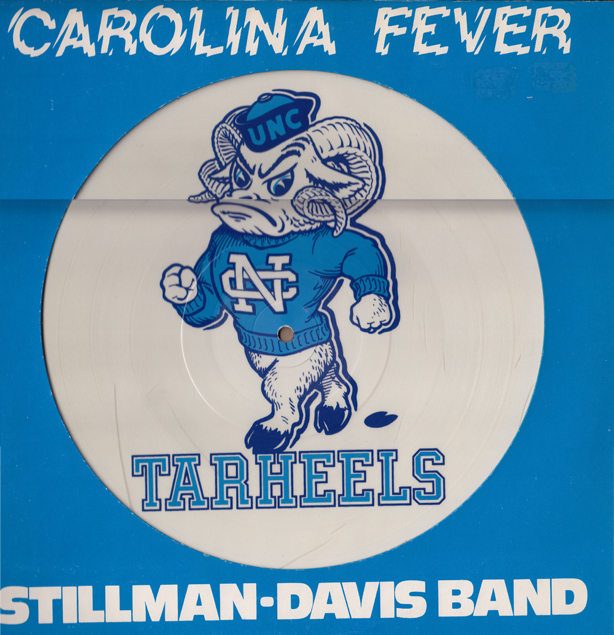 Although College Town records maintained a post-office box in Durham (strike one), the Stillman-Davis Band also produced a picture disc for the Fighting Illii, leading one to believe that the the hyphenated duo didn’t have Tarheel-specific Fever after all. Regardless, they’d clearly come down with something. I guess that’s what you get for messing around in Durham. Not to give anyone the impression that Carolina Soul has been bought out by ESPN, or, heaven forbid, Fox Sports South, but March Madness offers welcomed respite from all the other manners of madness that plague us April-February. I keep trying to tell my fellow Winston-Salemites/Tarheel brethren Stuart Scott and Hubert Davis—People don’t want all this sports gossip, off-court drama, and contract politics. They want iPhone photos and locker room improvisations. Props to Alan Lomax, the Mike Jordan of Field Recording. Props to the 2011 Carolina Tarheels Heels—Go wherever the winds of basketball greatness may take you. Nate Smith is a New York native and Duke University graduate student, who hosts Funk Disco Dance Fridays on WXDU 88.7-FM, Fridays from 6-8 pm. This rich, White Yank was granted the olive branch of blog space on Carolina Soul to bring some real love to Duke University for their 2011 ACC Men’s Basketball Championship. Coach K would not recruit Chuck D, but I feel like Radio Raheem right now: right hand, left hand, love and hate, Duke and Carolina… Left hand hate KO’d by love! I love you Carolina fans for being who you are and thinking what you think. But as my friend would say, Baby blue, Carolina is not populist! That’s State. Go cheer on that. Since becoming obsessed with the Big Ghost Chronicles, written anonymously by a Ghostface Killah-channeling genius, it’s hard not to call the Harlequins “shampoo-blooded” or simply “mad soft, b.” None the less, the University of New Jersey at Durham deserves some manner of acknowledgement for knocking the Tarheels off in the ACC Tournament last Sunday. I would call the Harlequins a poor man’s Four Freshman, but Duke University threatened to take legal action if I associated them with poor people. What deserves mention more so than this loofah-centric vocal ensemble is the backing prowess of the Harrison Register Quintet, comprised of Jim Crawford (tenor), John Ziolkowski (trumpet), Bobby Boyd (bass), Frank Bennett (drums), and Register himself on guitar. 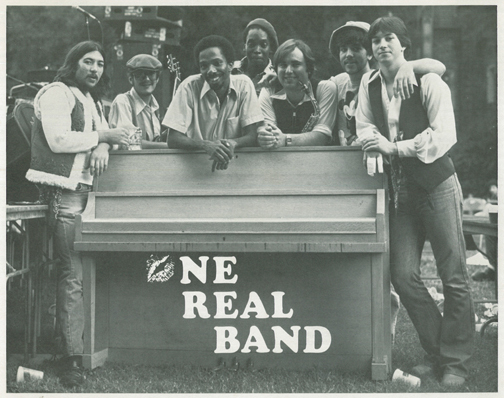 Bennett stands for having led the accomplished Duke Ambassadors a decade or so after Creed Taylor himself played trumpet in the seminal student ensemble. 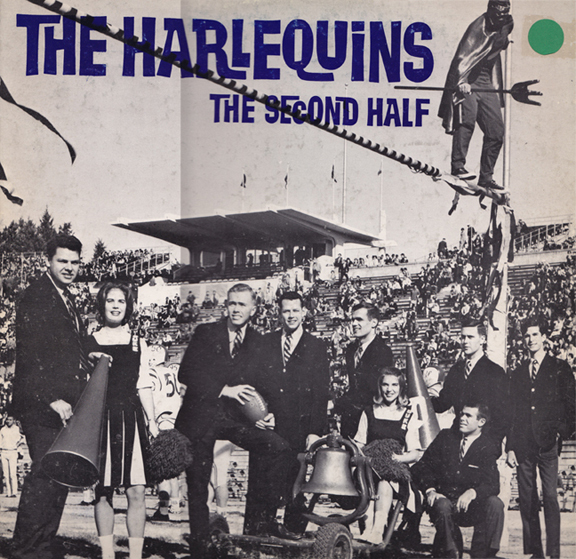 “Following an introduction by the Harlequins, a latin [sic] beat is the setting for this composition by arranger Wayne Barber.” Although the Harlequins have some serious pipes, and the Quintet some serious chops, they’re more like diet Carolina Soul. Carolina Soul-lite, Nahmean?